Paragraphs? No problem. Headings? You’ve got them under your belt. In fact, you’re now familiar with the basic structure of a web page. The small selection of tags that we’ve discussed so far are fairly easy to remember, as their purposes are obvious (remember: p = paragraph). But what on earth is a div? The difference can be seen below. The purpose of a div is to divide (hence the abbreviation ‘div’) up a web page into distinct sections — a basic structural framework with no styling — whereas p should be used to create a paragraph of text. Never use an XHTML element for a purpose for which it was not intended. This really is a golden rule. You can have as many paragraphs as you like inside that div element, but note that you cannot place div elements inside paragraphs. Think of a div as a container that’s used to group related items together, and you can’t go wrong. Take the homepage we’ve been working on (index.html) and, in your text editor of choice, add <div> and </div> tags around the sections suggested in Figure 2.19, “Noting distinct sections in the basic web page”. While you’re adding those divs, add an id attribute to each, appropriately allocating the names header, sitebranding, tagline, and bodycontent. Remember that attribute names should be written in lowercase, and their values should be contained within quotation marks. An id attribute set to header should not be confused with headings on the page (h1, h2, and so on); nor is it the same as the head of your HTML page. The id= attribute could just as easily have been named topstuff or pageheader. It doesn’t matter, so long as the attribute name describes the purpose of that page section to a fellow human being (or to yourself 12 months after you devised it, and have forgotten what you were thinking at the time!). 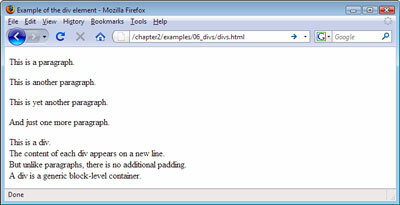 We already know that divs can contain paragraphs, but a div can also contain a number of other divs. This is called nesting. It’s not tricky, it’s just a matter of putting one div inside the other, and making sure you get your closing tags right. Nesting elements can help to logically group sections of a web page together, just as you might do in the real world by placing a selection of small boxes containing similar items inside a larger box. As Figure 2.19, “Noting distinct sections in the basic web page” shows, some nesting is taking place: the “site branding” and “tag line” divs are nested inside the “header” div. It’s a good idea to indent your markup when nesting elements on a web page, as is demonstrated with the items inside the div section above. Indenting your code can help resolve problems later, as you can more clearly see which items sit inside other items. Note that indenting is only really useful for the person — perhaps just you — who’s looking at the source markup. It does not affect how the browser interprets or displays the web page. How does the web page look? Well, we’re not going to include a screen shot this time, because adding those div elements should make no visual difference at all. The changes we just made are structural ones that we’ll build on later. Don’t go overboard adding divs. 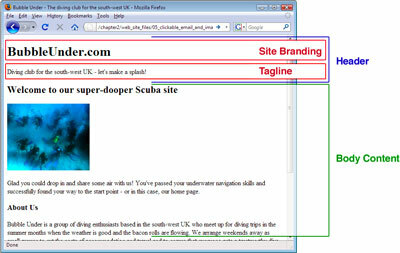 Some people can get carried away as they section off the page, with <div> tags appearing all over the place. Overly enthusiastic use of the div can result in a condition that has become known as “div-itis.” Be careful not to litter your markup with superfluous <div> tags just because you can.